A bread machine can be a valuable asset to your kitchen. I can, but don’t want to, live without it. Once upon a time, I was a lost cause in a kitchen store. Santa Barbara was a fairly smallish town when I lived there as a college student, newlywed, and then a young mom. And “the” kitchen store was Jordano’s. It was upscale as most thing in Santa Barbara are. It was a wonder to behold. I drooled with envy each time I walked in. I spent a lot of money on dishes and kitchen gadgets in those early years of homemaking. Some of those items went the way oaf the garage sale years ago. Others, like my favorite dishes, are with us today. Over the years, I’ve learned to stay out of kitchen stores, unless I have a particular need. My knees still get weak when I walk through Sur la Table or Williams-Sonoma. I have a husband-turned-Alton Brown-fan who regularly reminds me about the dangers of unitaskers. That does not, however, deter me from the small kitchen appliances that I know and love. With time I’ve discovered which items really help me in the kitchen and justify their use of kitchen real estate. This series is designed to help you consider which kitchen appliances you might want to make a part of your kitchen team. Can we talk bread machines? When I married Fish, I moved into his little 200-square foot studio. It was the pool house/guest house on a larger property. His landlords became family to us during the five years we lived there. Karen was also a fan of Jordano’s. One day she brought home a bread machine. It was big and bulky. We were all fascinated about how it worked. I remember gathering in their kitchen, clustering with their kids around the machine, to peek through the window. It was like 1950s tv for the 90s. Since we lived in such a small space, it didn’t seem like a practical purchase for us. Fast forward five years and we were a young family living in a 2000 square foot home. We lived in a rural area. Most of my friends grew vegetables in the garden, ground their own wheat, and baked their own bread. I borrowed a friend’s mill and heavy-duty mixer to see if I was ready for the expense. I wasn’t. Too loud, too bulky, too much flour dust flying. I didn’t see how a Bosch would really help me in the kitchen, especially when I hated to clean it. Instead, while browsing through Target I saw that bread machines had reduced in price as well as size since I’d last seen one. The cheapest model was a sleek $50, significantly less than the mill and mixer combination I’d been considering. Hubby got me one for Christmas that year, 2001. Over the last dozen years, we’ve gone through two machines, always the lower end model from Target or Walmart. This means the Oster or Sunbeam by default. I don’t have experience with the higher end models, but I know folks that love them. 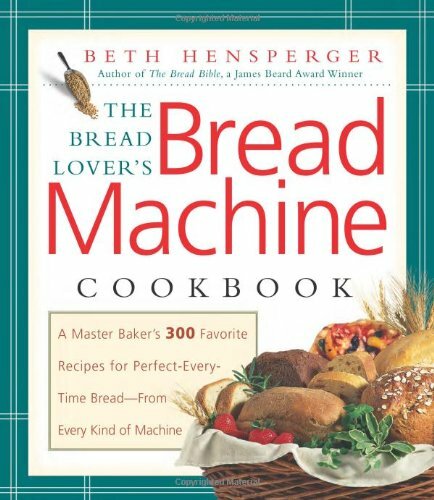 One essential companion to a bread machine is The Bread Lover’s Bread Machine Cookbook by Beth Hensperger. I purchased this early in my bread machine ownership. My copy is falling apart. This bread machine cookbook offers excellent advice on how to get the best performance from your machine as well as how to adapt your own recipes to bread machine recipes. It’s really not that hard. Over the years I’ve expanded my baking supplies to include parchment paper, silpat mats, and a bench knife. These aren’t necessary for using the bread machine, but they are nice to have. I’ll be honest, I’m not currently a huge fan of bread baked in the machine. The paddle sometimes lands in a weird spot. The bread sometimes sinks. 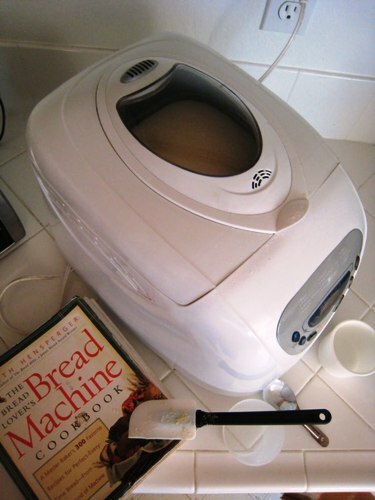 The Bread Machine cookbook helps counteract some of that, offering tips and foolproof recipes. Once upon a time, I baked bread on a daily basis in the machine and that worked really well for us. But, since my family can now inhale a loaf of bread in a matter of seconds, I find it more helpful for making dough. Why not use a mixer then? Ah, good question. I have a love-hate relationship with my KitchenAid mixer, an appliance that my husband bought me for my birthday about five years ago. It’s the mess and clean up that slay me. Plus, to make bread dough in the mixer, I have to think. I have to watch and adjust how long the ingredients have to mix. I might need to change the hook or paddle. I don’t really have to think with the bread machine. I just add the ingredients and push start. I come back ten minutes later with a rubber spatula to make sure everything’s mixing well into the dough ball. Then I just walk away. No greased bowls, no rising time, no thought. We use the bread machine weekly to make pizza dough as well as several times a month to prepare other baked goods to freeze. Three bread machines in twelve years? I’m not sure if that’s a good record or not. I’m sure as soon as I hit publish on this post, the current machine will die. That’s what happened the last time I waxed eloquent about the bread machine. Our first two machines outlived their bread pans. The bread pans are more expensive to replace than buying a new machine. It shouldn’t be that way, but it is. Take good care of the pan. Some folks don’t like the idea of storing such a large machine. In seasons when I used it on a daily basis, I was happy to have it on the counter. Nowadays, it’s stored in a lower cupboard of a desk in our kitchen. We pull it out a few times a week and then put it back in. In seasons when it sees a lot of use, I leave it on the desk that doesn’t really get used as a desk. If you don’t have kitchen storage space, you can stash it in a nearby closet or cupboard in the garage or hall. We got our first, second, and third machines new. I know plenty of people who’ve found new or gently used machines at the thrift store or at garage sales. You might even ask a friend or neighbor if you can borrow their machine to see if you like it and if you have space in your home for the appliance. As I look at the current models available and see that they don’t look significantly different than they did twelve years ago, I’m a little taken aback by the pricing. The models we’ve purchased were $35 and $50. I don’t see a machine for less than $70 currently. If I were to replace our machine now, I’d probably use a coupon on what was available at Bed Bath and Beyond to get the price point lower or use Swagbucks. 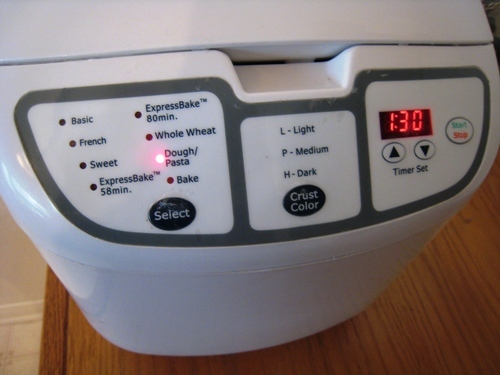 What’s your experience with a bread machine? I love, love, LOVE my bread machine. I use it all the time to make our favorite homemade dinner rolls at least once a week. My kids inhale them. i found my machine for about $15 bucks at an estate sale down the street 3 years ago. It’s still going strong. Absolutely LOVE my bread machine! My mom gave it to me a couple years ago for Christmas. It gets a LOT of use, especially in the winter, so we have bread to go with our soup 🙂 Pizza dough and Foccacia bread are it’s two other main uses. Mine is Oster, and it really is quite a quality machine. I love my bread machine! My dad won one many years ago, and since my mom already had one, he gave it to me. Still going strong! I use it mainly for dough, for many of the reasons you stated. I just made your Wholesome Energy Bars for the first time this week – so good! I also make pizza dough, dinner rolls, cinnamon rolls, poppy seed bread, and plain old wheat bread. My kids love all of it! Love my bread machine! Use it at least weekly, sometimes more for making dough. Hardly ever bake in it any more, but I love the set it and forget it part of dough making. Pizza dough is our most common, followed by your butter horns or plain old soft bread. Hubby got me a “fancy” model ($100) ten years ago and it’s still going strong. Ten dollars a year? No problem! Love mine and use it the same way you do – prefer the texture of oven-baked bread, but ya can’t beat it for making the dough! I have a bread machine addiction. I use mine several times a week as a dough machine for all sorts of loaves, rolls, calzones…you name it. I grind my own wheat, so I have no qualms that I’m doing the “healthy thing” for my family. I thrift way more often than I prefer to admit, and over the past 4 years, I have bought at least 20 bread machines (most for under $5) I have had SO much fun launching bread making careers in friends and family! For two years I was a Titus Woman in our Church’s MOPS group. I usually gave a thrift store bread machine as a door prize at each meeting. The young mothers loved it, and two years later I can see from Facebook that they are still using their machines and expanding their bread making skills. Several have even invested in their own wheat grinders. It is an amazing feeling to be able to share something that is so healthy for young families! @Susie E, I’ve goten 3 at the thrift store myself . I think I too have an addiction, but have run out of space for anymore. Folks around here seem to be uninterested in making their own bread for some reason. I know that there are several reasons for baking one’s own bread: Improved taste. Control of ingredients. Cost savings. Creative satisfaction. I’m considering getting a bread machine if I can score one at a very good price. I trust that the home-made machine-made bread is tastier than the typical store-bought loaf. However that could drive up the consumption of bead, off-setting any money that might be saved by making instead of buying bread. Has anyone calculated the money saved? Obviously return on investment depends on the price of the bread machine. But what is your calculated cost per loaf? @Nancy, after the price of the machine, I think that I spend about $1 on a batch of dough for 4 pizzas or a loaf of bread or 2 dozen rolls. I think it’s absolutely cost effective, even if you eat more bread. Plus you can control what goes in it. Commercial bread is full of junk. @Nancy, And if you’re not opposed, I’d say shop your local thrift store for a cheap one, just to see how you like it. You could always give it away, if need be. My local thrift store does returns within 7 days of purchase. And you probably will only pay between $5 – $13 for a machine that was hardly used. I completely second this reply. I originally had the Sunbeam model you do and used it a few times but never really liked the way the dough or bread would turn out. I just thought it was me and that it wasn’t going to work for us. Then Christmas before last, I asked my Mom for the Zojirushi bread machine and low and behold I got it! We donated our Sunbeam to Goodwill. I LOVE THIS MACHINE! Seriously, even though it was a gift and we paid nothing for it, if mine died I would so pay the couple hundred dollars to replace it with another Zoji. I always make dough in it as I like to freeze butterhorns or rolls and then bake as we need them for dinner. I also like bread loaves baked in the oven better, just personal preference. But I always always have perfect dough come out of this machine. It is always tender, mixed and risen perfectly and so so easy to work with. I can not do yeast breads or doughs manually to save my life. But with my Zoji I look like I know what I am doing. Plus it is so much cheaper and healthier for us when I make these things myself. I can control what goes into them, how many I get out of the recipe, etc. Seriously, I know it is a serious investment but so worth it. These machines last and last if well taken care of and the double dough hook, 2 lb capacity, and regular loaf shape make it phenomenal. I just love this machine and would not do without it again. @Ellen, I love my zoji! Got it as a gift from my folks many years ago and used it rarely. I’ve used it several times a week for the past few years for pizza dough, sandwich bread dough, roll dough, french bread dough, etc. The two paddles are nice, but my favorite feature is the 45 minute dough cycle. Love it!! I’m a very lucky girl — I found my Zoji at a thrift store for $10. I had a huge Dak (R2D2) at the time and, even though it worked well, I didn’t like the huge loaves of round bread it made. It took me a little while to get used to the Zoji but now, most of the time my bread does come out well. There are a few weird but edible mistakes. Oh, and for the lady who wanted to get a manual for her machine, just Google ” **** manual” and you should be able to find one online. Ex: I googled Zojirusi BBCC-X20 manual” and found it easily. You need to know the model number of your machine and sometimes that’s not as easy to find. I had to look at a whole bunch of Zoji’s online to see which model I had. I love my bread machine, but I use it only in the summer (I use the 5 minute per day bread dough during the winter, which justifies turning on the oven and heating the house more). I purchased my Panasonic Bread (never used!!) Machine at Goodwill for $4.99 several years ago, it came with no directions but I found a book at the local library ?maybe the Breadman series that provided directions for my machine. It has been well used, if only for 6 months per year!! Must be the only hater in the bunch. While it is much more convenient to dump ingredients in and walk away, I found it difficult to store and that I wasn’t using it. Gave it to my sister in law. Now I use my stand mixer or food processor. I really love mine. Had one back in 2000-2001 and used it all the time. Then I just stopped using it so gave it away. Fast forward to 2012 and wanted to use one for more than bread loaves. Got a cusinart and absolutely LOVE it. I also use Beth’s book. So easy!!! Actually bought potato flakes just for a few in her book. Her beer bread is great!! I have one… its been in the cupboard for about 10 years.. I should use it.. but I dont. I’ve had one since 1989, I think, and have used it hundreds of times. I go in cycles of making bread regularly in it, making bread in my KitchenAid mixer, and using it for dough. “Time” is what usually determines whether I use it for Friday pizza dough or not. The bread maker takes 90 minutes, the KitchenAid only about 40 minutes. If I get started early enough, I use the bread maker, if not, the other. I’m on my third one in 24 years. I had one many years ago and used it until the motor went out. At that time, I switched to a Kitchen Aid and the regular oven for baking bread. Stripped the gears in the Kitchen Aid, so I switched to the Bosch mixer 6-7 years ago and have never looked back. I recently bought a grain mill to mill my own wheat. I do have a bread machine again, but the only time I use it is in the hottest part of summer. I can set it in the garage and let it bake there without heating the entire house. I LOVE my bread machine. I have a Zojirushi, but I don’t think the brand matters. I use mine a couple times a week. I make all of our bread products. For Christmas this year, we bought our two daughters bread machines, gave them copies of favorite recipes, bulk yeast and gluten, as well as copies of your cookbook. They each say now that they don’t know how they lived without them. My bread machine is big so it usually resides in a corner of the dining room on the floor. I fill the pan in the kitchen, then pop the pan in and hit start. A little unconventional, but it works for me! My neighbour bought the Bread Machine made the bread and did not like the machine and he pass that machine to me as new one. I love my bread machine so much that I can do without it. I just make my dough on dough cycle and then bake my different kind of bread, pizza, bagel, buns etc. in the oven It is best to have in kitchen list. I love mine. Your post sums it up for me…..I also have the cheapest model and use it for dough only because “I don’t have to think about it” Friends are surprised I don’t love my kitchen aid for making bread. When I did use the kitchen aid I made rolls for holidays only and pizza once in a while. With my bread machine these are regular menu items. The only problem I have found is the bottom (outside) part of the pan and inside part of the machine wear the paddle fits in seems to get goopy/greasy after several years and is hard to get clean. Have you had this problem? @Tami, I clean the inside of the paddle out with a toothpick and scrape around that part of the pan really well. So, if you’re talking about dough build-up, there’s that. As for true grease, like WD40 grease, that happened right before the bottom of my pan fell off completely from the first machine. On of the paddles of my Lumina Bread Maker Machine won’t get off the pan. Pls help taking it out without damaging the paddle! Thanks a lot! I don’t have that machine. I recommend contacting the manufacturer. @Tami, I had that problem with my pan too, and then it started squeaking when in use. I still use it, but so annoying. I was actually wondering if I should add more oil to it with oil/grease already leaking out. @NIA, eventually the entire paddle mechanism came apart on mine. I lifted the pan and that center fell out. It may be a warning that the pan is on its way out. @Jessica, Well, it’s a good thing I only paid $11 for my machine. Got it from a lady that said she only used it once. When I called the manufactuer to see what I could do about the grease and squeaking, they suggested I buy another pan for $32. Now that I know the pan is probably on its way out, I should probably take them up on that. Except I’m not sure I want a bread pan that costs more than the machine LOL. I recently bought a bread machine at a thrift store and I love it!! It’s an older model that’s larger and less sleek looking than the new ones, but it did not look like it had been used much and had the instruction booklet with it. I have only used the dough cycle, but it’s such a time saver. No mixing bowls to clean up or kneeding to do. Thanks to the bread machine, we had Italian breadsticks with our dinner even though I taught piano during the afternoon. I think eventually I’d like to get one that can make 2 lb. loaves. I really need to check out the bread machine cookbook, too. I’ve been intrigued by bread makers for sometime now, and, hopefully soon will actually buy one! After reading what is in your basic store loaf of bread, I definitely want to make my own. Making hotdog/hamburger buns in a bread machine is also a big plus in my book. Have you ever made bagels in yours? @Denise C., I have made bagels before, but I don’t have a great bagel recipe where it makes us want to keep doing it. It’s on our list, though. @Jessica, Did you try the one in Beth’s book, or another? I put a bread maker and Beth Hensperger’s cookbook on my amazon wish list! A friend said she would let me borrow her bread machine, test it out before I buy one of my own! I am so excited! Quick question, would I use yeast specific for bread machines, or would regular yeast be ok? @Denise C., I buy the big bags of SAF yeast at Costco. As far as I know it’s regular yeast with vita C added. It’s what’s recommended in Beth’s book. I have always been a purist and proud of it… but now that I am married and have a child, I really wish I had a bread machine! 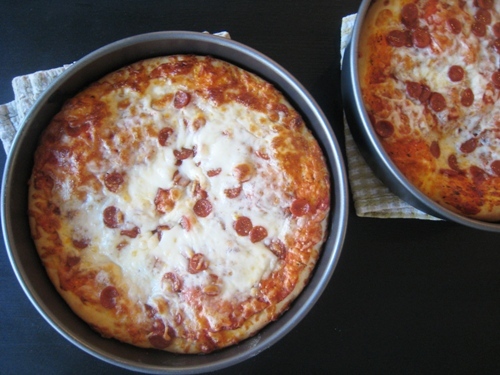 I’d love to have pizza every week, but using the kitchen aid is such a pita, and I hate the cleanup too!! These replies have been great – I think I’m going to hit up some discount stores and estate sales, and if I can’t find one I’ll ask for one for my birthday in a few months! @LB, I wondered this, too, but the pan is non-stick and cleans very easily. I haven’t had a problem with anything getting in the machine itself until today =), but it;s just a little flour that can be cleaned quickly. @Kristi, Thanks for the reply! @LB, motherhood will do that for you. I was once a purist, too. LOL. Now, I’m a realist. 🙂 What Kristi said, super easy to clean. I’m on the fence, mostly because I haven’t found a pizza dough recipe I like. Do you have a good one for the bread machine? I got a very fancy Williams-Sonoma one from Freecycle (!!!) a couple years ago and that thing is wonderful! Only downside, there’s no manual and so I don’t know how to use some of the fancy features (it has a jam setting?). But we use it to make pretzel dough, bagel dough and occasionally a loaf of bread. try looking up the model # on-line. I did that with my Craigslist KitchenAid mixer and just printed it off. I have one that I got for $2 at a church rummage sale. Best $2 ever spent! Yes, it’s bulky, but I find myself using it more and more. I like the loaves best when they are baked in the oven, so I need to just use the dough setting more often, like you do. Great perspective on bread machines! I have 3 bread machines. One was purchased new about 8 years ago for $50, and the other two for $5 from yard sales. I use two regularly and at times have all three running. Now I have started to grind my own flour. For me it is as much about health as cost. I see how long a loaf of store bought bread stays “fresh”, and it is just not natural. I make all of our breads and have no interest in going back to store bought. I see how long a loaf of store bought bread stays “fresh”, and it is just not natural. This is exactly why I want to begin making my own bread. I read through the ingredients, seriously I could not pronounce half of them. Flour, yeast, salt, sweetener, water (I’m guessing on a few of those) is all I’d expect to find in bread (unless it’s a flavored or seeded one). You need a sweetener to feed the yeast, and the salt helps tame the yeast. It’s all about balance and chemistry. Honey is a natural preservative, and will help legthen the “shelf life” of homemade bread — but who has leftovers? Honey also provides better browning of the crust (carmelization); if you like a darker crust use a dark, amber honey. @Denise C., commercial bread is getting more and more fake. I LOVE my bread machine-I’m on my second one, and use it several times a week. I hardly buy bread anymore! I bought my bread machine at a thrift store for $5. I don’t use it to make bread ever but I do use it for dough as a timesaver almost weekly. Mostly I make large batches of bread (4 at a time) so I use my Bosch but for pizza dough or one or two loaves I’ll use the bread machine dough cycle. For five dollars it was a great investment! Love mine! I got it a couple years ago for $8 at a thrift store and use it all the time! I never bake in it, don’t like the shape. I make most of our bread products. We rarely buy bread, rolls, pizza dough, buns, anything like that now. Even though it is big and I have a small kitchen, totally worth it!! I just downloaded a manual for it online using the model #. I absolutely LOVE my bread maker! I asked for it for Christmas last year and my grandma was willing to oblige. We started using it regularly in July…haven’t bought storebought bread since! Ours has a delay setting on it, so I can put all the ingredients in just before bed and wake up to the smell of fresh bread! I have also used it for dough. I did not use it for jam because I made way more jam than would fit into the machine! My grandmother bought me a Panasonic bread machine about 15 years ago. It was $300! It lasted forever and had a yeast cup on the top of the machine that dumped the yeast at a certain point in the cycle. I loved that bread maker. The next one was a cheap-o from Target. It still worked when my husband bought me a new one for Christmas. I was never sure why he bought me a new one except that he knew that I loved to make rolls and he loved to eat them. Anyway, I gave my mother the 2nd one and started using the newest one. She still has the 2nd one and I still have the 3rd one. She makes mostly bread and I make mostly rolls. Rolls don’t last long around here. LOVE mine, I am more like on my 7th or 8th in almost 20 years. I also only use it for the dough cycle, crescent rolls, Challah, honey whole wheat, cinnamon raisin, French, pizza crust, etc. They don’t last, that is for sure and when I called one of the companies once, they told me my usage would be considered “heavy”…………that is fine, we love our bread around here. I have a Kitchen Aid too and do use it if I am making multiple loaves, but I still love the bread machine for normal single loaves. My favorite cookbook is by Donna Rathmell German. Used to be five paperbacks, now one hardbound, but out of print…………. Someone gave me a bread machine but I admit it has been only used once to make a cake lol. I make bread with my Bosch and bake it in the oven, but after this post I may dust off that bread machine and give it a try! If not for the complete bread-making, I do want to try out the dough feature. This is helpful! After 9 years of marriage, our hand mixer and blender have long ago perished, and we never had a food processor. I do use a dough mixer (an old Bosch machine of my mom’s) to make up big batches of bread dough (no hand kneading with 4 littles, thank you very much) :), but have been considering an investment purchase. One of the things I was considering was a kitchenaid mixer, since I thought it could do the dough and mixing, and I could get a processor attachment. But would you recommend sticking with separate appliances? A food processor has been on my want-list for a while now, but I have limited storage space, and really just wanted 1 thing that could do everything for me. I’d rather spend a bit more money to get something that will do a lot and last a while instead of buying many cheap and helpless items (our old blender couldn’t even blend water). Do you have any thoughts? Thanks, and sorry for the long ramble! I love your blogs! I’m going to be reviewing a number of small kitchen appliances over the next couple months. I have a handful of personal favorites, food processor being one of them. @Jessica, Yay, thanks! 🙂 I guess I’ll just have to be patient….and continue checking your blog several times a day for new updates. 😉 Your crockpot red sauce and the wholesome energy bars are new favorite recipes. I killed my first bread machine (a small inexpensive one back in the late 90’s) and just like you I used that one to bake the bread in. I had two young children and it worked…lol. When that one died I bought a Zojirushi and I’ve been using it ever since. My favorite setting is definitely the dough setting. I have my Kitchenaid mixer and a larger Bosch mixer, but I use them infrequently now == at least for bread making. So much so that I am considering giving away the Bosch to a friend. I can’t imagine life without a bread machine. So much so that it was one of the first gifts we bought our daughter in law. I love my bread machine and got it years ago at a yard sale for less than $10. It’s earned it’s keep and then some. I’ve failed miserably at making good loaf bread by hand, but I can with the bread machine’s help. I make the dough, then rise and bake it in the oven. I too love pizza and use it for the dough. I’ve really underutilized it till this year. Money got tight, which has been a blessing in a way as I’ve thrown myself into baking. I had plenty of wheat berries to grind and plenty of time on my hands, so away I went into the baking. I found a breadman bread machine at a local thrift store last spring for about $6. I was talking with a friend who has one and she suggested I look there first. It works perfect. My hubby found the instruction manual online. I have enjoyed using it to bake bread as well as mix the dough. Love love my bread machine! Bought both from Goodwill for $5. And use them several times per week. I am going to check out your pita recipe! Love my Zojirushi machine. Bought it new after researching brands and have not purchased a loaf of commercial bread since Sept. 2011. I haven’t gotten into grinding my own flour (yet) as I purchase twenty-five pound bags of bread flour from Sam’s or the local vegetarian market. After clearing the cost of the machine I have calculated that a loaf of white bread costs about 25 cents, wholewheat slightly more, maybe 30 cents. I get requests for bread all the time from family members who either have no bread machine or prefer to have someone else bake it for them! MY MIL gave me one as a shower gift 16 years ago and I used it all the time until my 2nd child was 3 or 4 years old. Then we moved…and I noticed that I wasn’t using it anymore, so I donated it. Fast forward to 3 months ago, I decided I wanted to have more control over what my family ate (and to have less bread in the house). I make 2 1.5lb loaves a week and everyone is happy. Because I have celiac, the one that I bought has a GF cycle that makes it easier to bake off. It is a bulky machine, but I think having it to make all sorts of delicious baked goods outweighs the negative. It was on sale at Macy’s and I paid $99, and also got 12% back on a rebate site. I love my bread machine as well! for all of you who don’t like the way the bread turns out: try taking your bread out a few minutes early. I found that my crust was hard, even on the “light crust” setting. I started taking the bread out 10 minutes early, and found that it was completely and perfectly baked, even though the cycle wasn’t complete. The crust was still a little harder than we prefer, so I tried taking out the bread 20 minutes before the cycle completed. Perfection! This doesn’t work with every bread recipe, but it certainly works well for the basic white bread recipe. Thanks for the great post! My bread machine has been collecting dust but you have inspired me! Is it possible to freeze the pretzel dough balls for later? My experience in freezing dough balls is that it must be done about 30 minutes after mixing the dough. I’ve not tried it with the pretzel dough. I Use mine for pizza dough ,ghetto hot pockets, pretzels, english muffins,dinner rolls, cinnamon rolls, hamburger buns ( I haven’t given hot dog buns a whirl yet) But as far as making bread, not so much. I love it. I bought mine new and I really couldn’t afford it at the time but I’m glad I did.. I LOVE mine! I’ve worn out 3 in the last 16 years. About 2 years ago mine broke. I saved up to get one about $100. I went to kohls, the only store in town that had one! It was on sale! I was exited. Sale price $79.99. At the register it rang up $7.99!!! I told the cashier it was a mistake. She assured me it wasn’t. My friend and I went to 4 more stores and between the 2 of us we bought 9. I gave one to my cousin and I have used the other 3 all at once time and again! Love it! THAT is amazing. I would have bought as many as I could at that price as well. I’m on my 4th machine in 13 years. Not a great track record, but the first and the fourth have each lasted quite more than 5 years. Those two in the middle were duds, I think. I am trying to learn how to use my bread machine. I have a chef mate. I got it used so there is no manual and I cant find one online. I can make the bread and I could eat it but my hubby says the bread is too thick. I am frustrated bc it takes so long to make it so its hard to learn your mistakes. Have you reached out to chef mate to see if they can send you one? I do have to say, I’ve never bought a chef mate product I liked. I have bought them cheap at target and they constantly fail. If you’re having troube, I’m guessing it’s the machine and not you. do you have to use bread machine flour??? or can you use regular flour? I just bought an Oster Expressbake and it says bread flour for most of the recipes…. I had wanted a bread machine for a long time without exactly knowing why. We didn’t need more carbs; I’m not a big bread eater; I haven’t used my pasta machine for years; and my daughter worked at a bakery/restaurant so we had access to gourmet bread. However, the itch wouldn’t go away. Then they came to my grocery store at $50. I read the box and debated…and resisted. Then one day, it was on clearance at $35, and I grabbed it. The freezer had lots of bread from an overage at my daughter’s job so I conscientiously put away my bread machine until we had eaten enough to make some room. Then I pulled it out. It’s only been put away twice since then for a couple of days at a time. For me the bread machine is the perfect compromise between the “earth mother” I long to be and the practical, busy modern person I am. I am currently using the Betty Crockers Best Bread Machine Cookbook. I measure my bread flour ahead of time into individual Rubber Maid containers and can have a loaf going and the kitchen cleaned up in about fifteen minutes. Fresh, hot, homemade bread makes any meal special and seems to be a highly prized gift. I love it! Yay! I totally get you and I love your earth mother illustration. My kids now make the dough for me and that is awesome. All of these posts have been so helpful. I bought a bread maker at a yard sale and just barely started using it. So far everything has been a disaster. I have thought about using just to make dough and bake in the oven, that seems to be the best ideas. I am also going to order Beth’s book and check out the Betty Crocker one. I need all the help I can get! Just read up about a breadmachine. I bake once a week two loaves of whole wheat bread with nuts and oats added. I love the smell of baked bread in the house. I also make pitza dough with whole wheat, oats, sesami seeds and onions. Very tasty. I must say , it is a little bit heavy on the machine. I already finished four bread machines- Morphy Richards.I am looking for something with a stronger motor. Can you suggest any item.